DG Heath Timber Products, Ltd. has announced that they have increased their stock area, allowing the Swansea based company to make larger bulk purchases of timber. The company hopes that this move will stabilize pricing and supply for local tradesmen after a year-long shortage of timber. DG Heath Timber Products is a family owned timber supply company that serves Swansea, South Wales, and surrounding areas. With 30 years of experience, the company has seen market ups and downs. Dean Heath attributes their success to a focus on expertise, quality, service, and value. He stated, "Increasing our stock area has given us the ability to make larger bulk timber purchases. With more timber consistently available, local prices will stabilize and tradesmen will have a supply they can count on. The forest fires and increased building have hit the industry hard. We hope this move will bring back some consistency in the market." The building industry is not the only one competing for a supply of timber. Timber is also used to create paper, charcoal, cooking, toothpicks, utility poles, and fuel. A shortage can affect many markets from publishing to utility service. This increases the demand for timber on a large scale, causing instability in multiple markets. Last year, the timber industry has suffered from unreliable supply and unpredictable prices. Experts attribute the volatility to forest fires and higher demand for quality construction material. The shortage has especially impacted the supply of round timber logs of a desirable size for processing and use in a variety of building applications. Round timber logs are processed into many of the wood products used in construction. The journey from tree to structure requires many steps. First, timber is harvested from a property by loggers. Once harvested, it is processed, cut into planks, finished, and delivered for its end use. Timber is processed into many different products. Rough sawn timber is primarily used for construction. Its value is determined by its species, size, distance from processing, age, and end use. Defects, including damage, knots, and nails can reduce the value of a tree. 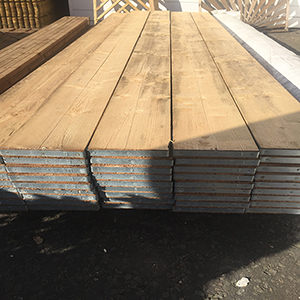 In addition to planks, timber is also sold in processed sheets. Plywood is constructed of timber cut thinly and bonded together, offering strength and durability over a large surface area. Waferboard and chipboard, like plywood, can cover a large surface area, but are constructed of smaller pieces of wood bonded together to create a sheet. Waferboard is comprised of wafer sized flattened pieces of wood which are bonded together. It is best used in rough or unfinished applications as it is difficult to process to a fine finish. Chipboard is constructed of small bits of ground wood bonded together. The surface of chipboard is smoother than that of waferboard, making it more appropriate for fine applications. Most processed sheets of wood must be treated before exposure to the elements to prevent swelling, warping, or degrading. Construction timber, whether it is plank or sheet, is typically oak or pine, with pine being the less costly option. Oak is the strongest of the two woods, but its expensiveness prevents it from being used in large building applications such as wall studs or other framing. Pine is less costly and provides ample strength for large scale building applications, including framing. Oak is often reserved for projects requiring extra strength or fine finishing. Timber quality is rated by grades and types. Rough sawn timber is generally straight and strong. It may contain knots or blemishes, but those do not detract from its strength. This is generally used in building applications which will be covered, such as framing for furniture and walls or for flooring underlayment. Joinery grade timber has fewer knots and a smoother finish, making more aesthetically pleasing. It is more costly and best used in visible applications including cabinets, furniture, trim, and mouldings. It is believed that the increased demand for timber and timber supplies will likely continue. Building trends and land development point to growth in construction and related trades. Timber offers a number of benefits, making it an ideal material for construction. It is strong, long lasting, and can be processed into a variety of products. In most applications, it is easy to work with and it is a renewable resource. DG Heath offers a variety of products including rough sawn timber for general building applications and joinery grade timber for finer internal applications. They also stock a variety of building supply products for indoor and outdoor projects. Customers can find treatments to preserve timber, fasteners, fencing materials, engineered flooring, maintenance free decking, and a large selection of power and hand tools. DG Heath is a family run business established over 30 years ago specialising in the supply of high quality timber related products to its customers across Swansea and the surrounding areas.